The Best of Show Collection: to showcase the outstanding quality of both cars and photography, we present 10 of history’s finest cars, each of which has won ‘Best of Show’ honors at prestigious events like the Pebble Beach Concours d’Elegance. 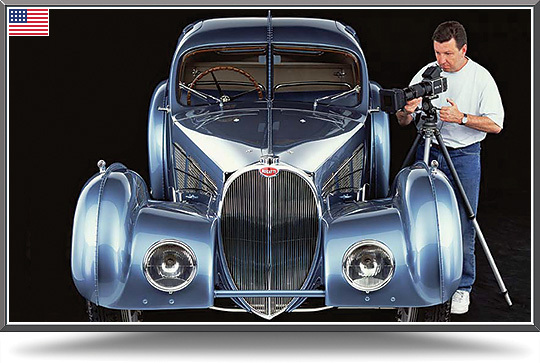 Scott Williamson's reputation grew with 30 years of commercial photography for clients like Rolls-Royce, Mercedes-Benz, Maserati, Lamborghini, Lexus and Ford, as well as custom car builders, advertising agencies and marketing firms. This fueled private commissions by collectors of some the rarest and most coveted cars, to record their classics for posterity. Using state-of-the-art equipment, Scott’s unique approach captures an automobile’s form, design and essence against his signature black background. An extensive photographic library of more than 900 significant cars — from Alfa to Zagato — has been amassed during his career. For the first time ever, reproductions of these images are now being made available to the public, and Car Art is privileged to have been chosen to offer them. Selections of the artist’s work are on permanent display at The Petersen Automotive Museum in Los Angeles, have been featured in the Blackhawk Automotive Museum in Danville, California, and are part of a major themed exhibit at the Saratoga Automobile Museum in New York state. Scott’s photographs have been published throughout the world in a variety of books and magazines such as The Robb Report, Automobile, Auto Aficionado, Octane, Car, Motor Trend Classic, Car Collector, Velocity, Sports Car Market, World Luxury, Photo District News, Petersen’s Photographic, Professional Photographer and The Commercial Image. Commission Scott to create a unique work for you!